The Cotswolds are renowned for their beautiful stone buildings and the stone roofs complement that beauty with their mellow weathered appearance, sizes diminishing towards the ridge and irregular edges. 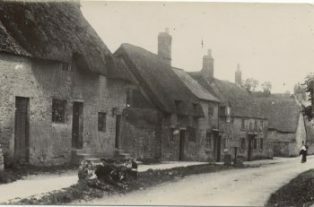 With the exception of expensive prestigious buildings which were roofed with stone slates most domestic buildings on the Cotswolds and in Chipping Campden originally had straw thatched roofs. This was especially so in the north of the Cotswolds where corn and wheat was more common than the south. Before the modern strains of wheat were developed good quality long straw was common, cheap and locally available. Thatched roofs require a steep pitch roof of an angle of at least 45 to 50 degrees to make sure there is adequate rainwater run-off. The large overhang at eaves ensures water is thrown clear of the supporting walls and window and door openings. Progressively from the 17th C buildings were being roofed with stone slates. This is perhaps due to the fire risk with thatched roofs or as a result of the “The Great Rebuilding” that swept the country between 1570 and 1640 or the transition from medieval to modern buildings over an extended period. This boom was fuelled by the diversion of money and resources from ecclesiastical to secular building following the Dissolution and the Restoration. Where do the tiles-stones come from? The geology of the Cotswolds is dominated by two limestone formations – the Great and the Inferior Oolite. The Great Oolite overlies the Inferior with a layer of Fullers Earth sandwiched between the two. The limestone from which tile-stones are made is a sandy, fissile or laminated rock and is found at the base of the Great Oolite. In the North Cotswolds most of the Great Oolite has been eroded exposing the Inferior Oolite ‘freestone’ from which many of the fine Cotswold buildings in the area have been built. However there are some areas where the base of the Great Oolite remains and here the laminated tile-stones may be found quite near the surface. Stone was quarried extensively around Naunton and Whittington but the tiles-stone for buildings in Chipping Campden were most likely sourced from shallow workings between Snowshill and Hinchwick. How are the tile-stones made? In some instances suitable limestone for roofing would lie close to or at the surface and would be gathered for use for roof coverings. These were called ‘presents’ because it seems as if they were a gift collected by Cotswold inhabitants. The quarried tile-stone was called ‘pendle’ and had to be split, generally by frost action. The stone would be laid in the open during the winter and the moisture in the saturated stone would freeze, expand and split the stone along the laminations producing stone of suitable thickness for roofs. Alternatively the stone could be split along the laminations or bedding planes with a suitable hammer and chisel. The ‘presents’ tend to to produce thicker tile-stones than the mined ‘pendles’. The stones were normally cut to size at at the quarry using a ‘slate cutter’ and sorted into groups depending on their size. A wooden ‘slate rule’ about 2ft long with a nail or screw at the head corresponding to the nail hole in the slate would be used for this purpose. The tile-stones were put into groups, named according to their locality, for example: ‘short pricks’ ‘long bachelors’ ‘long fourteens’ etc. The holes for hanging the tile-stone were made with a pointed hammer called a ‘slating pick’ like a modern ice axe. The micaceous nature of the rock helped with making a neat hole because the tiny layers are split off first before the hole is pierced. Why are the large stones laid at the eaves and diminishing in size towards the ridge? 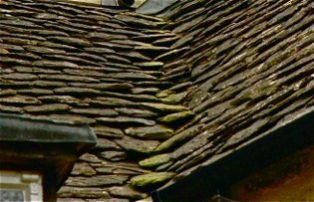 A roof built with Cotswold stone or tile-stone is by its nature ‘leaky’ because the stones are not a tight fit one with another, so there are gaps, with more gaps around the smaller tile-stones than the larger. During rainfall the volume of water increases as it flows down the roof and larger stones with fewer joints cope better with water run off which is concentrated at the base of the roof. Also before gutters became common the larger stones would overhang at the eaves and throw rainwater clear of the building beneath. There are those who say the stones diminish or graduated in size towards the top because the roofers did not want to have to carry heavy stones further up the roof slope than they had to. Each tile-stone is heavy, typically up to 46lb (20 kg) each. This is a considerable load for a timber roof to support. If the lighter stones are placed at the ridge this coincides with the centre of the span therefore imposing less load at this critical location. Why are Cotswold roofs such a steep pitch? As with a thatched roof, the steep pitch on a tile-stone roof (typically around 50 to 55 degrees), ensures there is adequate rain-water run off. Also the steep pitch reduces the risk of snow blowing back through the joints around the tile-stones. The roof pitch may have been set when the roof was formerly thatched and then later tiled. How are the tile-stones fixed to the roof? Tiles used to roof Roman villas have been found with the iron nails still in place. 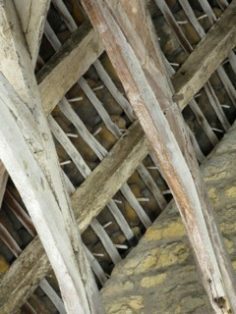 During the Middle Ages and later the tile was fixed to the timber tiling batten with an oak peg which hung over the batten. In the early 20th C galvanised nails were used. Today copper nails are used which are cheaper than oak pegs and equally effective. How long do the tile-stones last? Oolitic limestone is water soluble and in time will erode, especially as rain water is slightly acidic. Some say a tile-stone will last about 180 to 200 years, but 100 years is more likely. 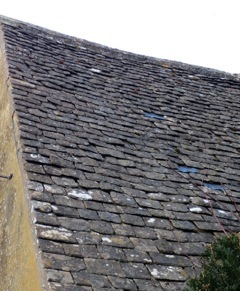 Recently Cotswold tile-stones were replaced on a Chipping Campden house built in 1909. The tile-stones being replaced were installed when the house was built,with an original thickness of approximately 20 to 30mm. At the time of replacement they had reduced to 7mm to 10mm. The weathering of the tile-stones was more severe on the west and south aspects, exposed to the prevailing winds. 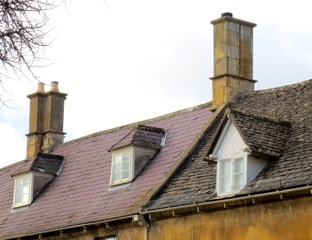 Therefore with a Cotswold stone roof, the tile-stones often need replacing every 100 years or so. Moss was sometimes tucked into the joints in the tile-stones to increase weather tightness and insulation, but moss is acidic and caused premature deterioration of the tilestone. 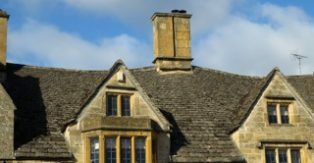 Why do Cotswold roofs sometimes sag? ‘Green’ unseasoned timber is much easier to work than dried seasoned timber so it was often ‘green’ when used in the construction. As the timber dried the timber shrank and cracked; loaded with tile-stones it would often deform because the timber was still ‘soft’. These deformations remained and were permanent. What is a ‘swept valley’? The flowing geometry of the thatched roof enabled it to twist up and down and around any dormer windows or corners in the roof. When tile-stones replaced thatch, these rounded forms were no longer possible. The ideal form is a simple pitch with no interruptions or corners, hips or turns. However the skilled roofers of their day developed techniques where the roof could turn through some angles. ‘Swept valleys’ is one such technique. The tile-stones were reduced in width and turned the corner in a seamless curve. The more commonly used lead valley gutter was avoided because lead was not readily available in the Cotswolds and was therefore expensive. Are Cotswold stone roofs still used today? There are a few quarries producing the traditional tile-stones but they are expensive compared with more modern materials. Tile-stones may be recycled from derelict buildings. Following the construction of the Stroudwater and Thames-Severn canal, Welsh slate became an economic alternative to Cotswold stone. The slate could be split into slabs of uniform thickness and size and was much thinner than the laboriously made and costly Cotswold stone. Slate was much lighter too so the roof timbers could be substantially smaller. The roof pitch could be less too with a further cost saving. An imitation tile-stone manufactured from concrete and reinforced with fibreglass is frequently used on new buildings. It gives the appearance of the traditional Cotswold tilestone and is probably more durable. These notes are compiled in good faith using information and opinion from a variety of sources. The author cannot guarantee the accuracy of such information or opinion or its context, and thus accepts no responsibility for any misdescriptions, errors or omissions. The notes are for general information only, and must not be relied upon for any commercial, technical or professional purpose. In such circumstances the reader is advised to satisfy him or herself of the position, if necessary, by seeking the advice of a suitably qualified professional or specialist. Any views expressed by the author are his own, and do not necessarily reflect those of CCHS.